Truly stunning Global Marine designed twin screw vessel built by Endurance Boats. At 18.34 X 5.5m the vessel has excellent survey standards 1B – 21 + 4,1E – 46 + 4,2B – 8 + 4,3B 4 crew. Powered by C-18 Cats, this heavy-duty boat is rated @715HP and comes complete with twin Cat gensets, Furuno navigation package including sonar and includes satellite phone/fax and data point communications. 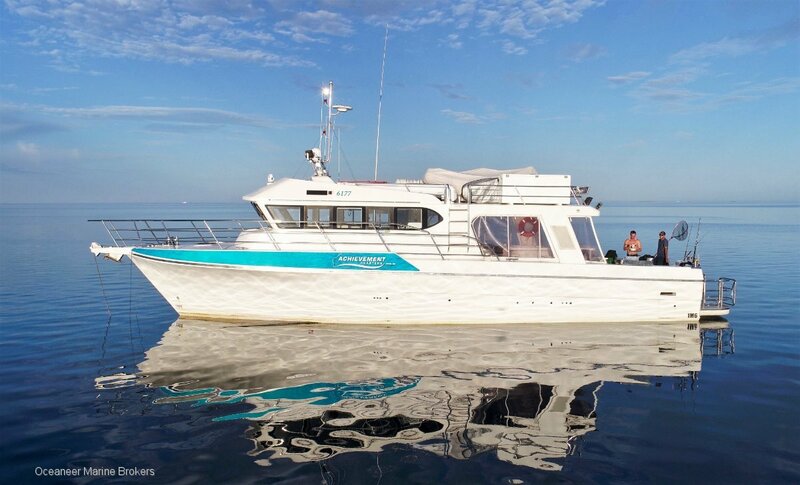 This vessel is extremely well appointed with 1 master cabin, six single berths, huge saloon area and spacious galley. Fully airconditioned throughout. You can fully appreciate your surroundings with a U-Shape bar including large ice maker on the saloon deck. Vessel also boasts sea keeper gyro. This walk in opportunity comes as a complete business with forward bookings, liquor and food licences, intellectual property, established marketing avenues including website, signage, facebook and Instagram accounts. electronicsFuruno echo sounder, GPS, plotter, radar, auto pilot and sonar. Plotter sounder combo on top deck, night vision, satellite compass, radio, wifi booster.